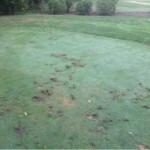 Trying to target skunks can be difficult if they are not living on the property. Possums raccoons and even squirrels will go after bait so it is important to know how to trap and remove the animal safely. 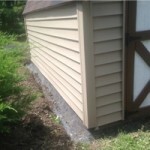 It is best to hire a professional when a skunk is causing a nuisance. 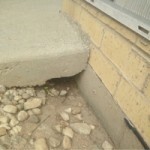 Usually a skunk will dig a den under a deck or concrete stoop. There will be a hole the size of a baseball or larger and gravel or dirt nearby. 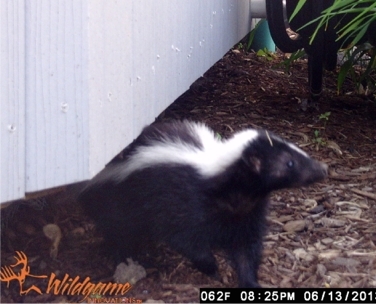 Sometimes a skunk odor will be present but not always. Droppings containing seeds will most likely be around the property. Wildlife & Waterfowl Solutions LLC uses specialized traps for skunk dens that will not allow animal to bypass and will remove them safely. Covers are used to minimize spray but it is still possible. Some skunks will go from den site to den site and some situations the skunk may move on by itself or leave on its own. It is important to seal up the den site entrance with materials that will not allow animal to return. 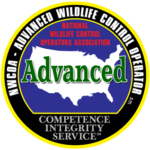 Wildlife & Waterfowl Solutions LLC uses materials that stop animals from getting back in.